C-FTOK after rebuild, at Saskatoon - CYXE, Saskatchewan. 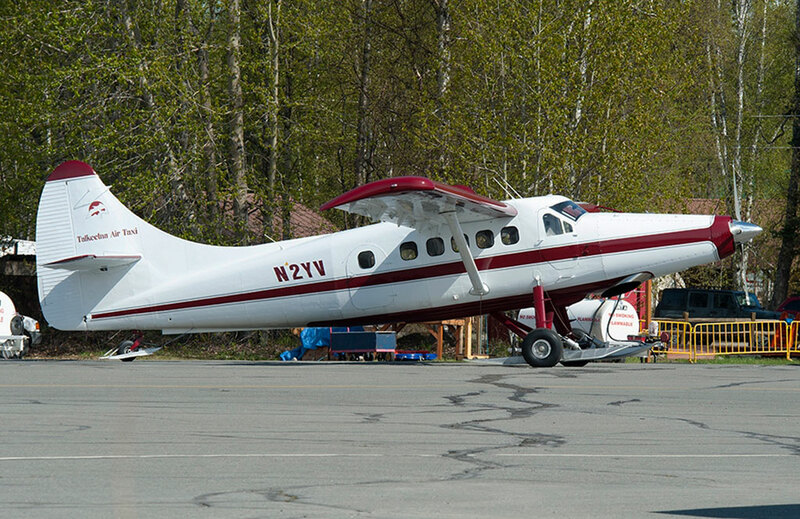 N2YV operating from Talkeetna - PATK, Alaska. N2YV off on another trip to the glacier. • IM-1709 Indian Air Force. Delivered 15-Nov-1957. Withdrawn from Inventory at Barrackpore Air Base, north of Calcutta on 31-Mar-1991. • No regn Mike Hackman Aircraft Sales / La Ronge Aviation, Saskatoon, SK. Note: Rebuilt by T.C. Aviation Ltd., Saskatoon, SK. • C-FTOK La Ronge Aviation Services Ltd., La Ronge, SK. Regd 10-Nov-1994. • C-FTOK North of Sixty Flying Services Inc., Plymouth MN, USA. Based Edmonton, AB., and Obre Lake, NT. Owned from 11-Jun-1996. Regd 16-Jun-1996. • C-FTOK North of Sixty Flying Services Inc., care of Brydon Denroche, Yellowknife, NT. Re regd 26-Aug-2002. Canx 07-Oct-2012. Removed from CCAR 26-Sep-2013. • N2YV. JB Leasing Co., LLC., Nikiski, AK. Regd 16-Dec-2013. • N2YV Talkeetna Air Taxi Inc., Talkeetna, AK Regd 07-Oct-2014. Otter 207 was delivered to the Indian Air Force on 15 November 1957 with serial IM-1709. After test flying at Downsview it was packed into a crate and shipped to India where it was re-assembled and entered service. The Indian Air Force continued to fly the Otter until the type was formally withdrawn from the inventory on 31 March 1991, and the surviving aircraft were offered for sale. The successful bidders were Mike Hackman Aircraft Sales / La Ronge Aviation, who travelled to India to prepare the Otters to be shipped back to Canada. IM-1709 was located at Barrackpore Air Base, north of Calcutta. It had accumulated 6,482 flying hours in its 33 years of service with the Indian Air Force. It was one of eight Otters to be shipped from Calcutta, which arrived at Saskatoon, Saskatchewan on 30 April 1994. 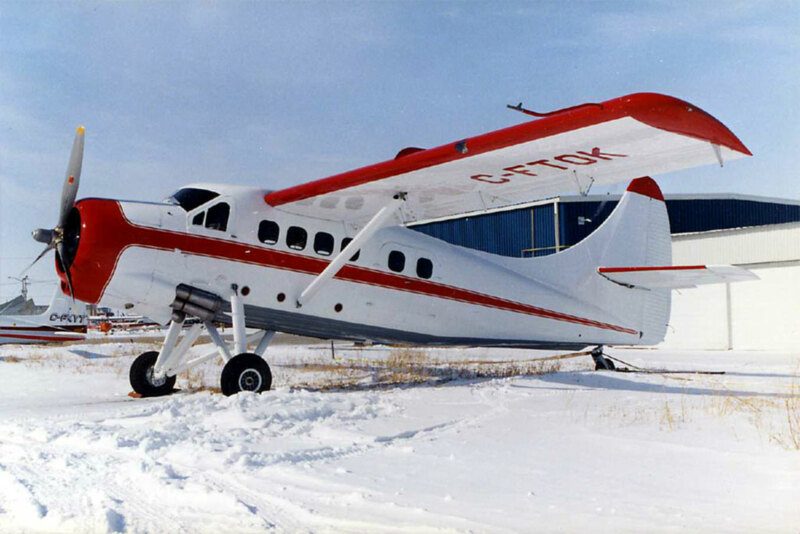 The Otter was rebuilt by T.C.Aviation at Saskatoon and registered C-FTOK to La Ronge Aviation Services Ltd., La Ronge, Saskatchewan in November 1994. It was sold to North of Sixty Flying Services Inc., Obre Lake, Northwest Territories in June 1996. This company was owned by American interests and had been established to provide a flying service to North of Sixty Camps, to service its fishing lodges. It was also associated with North of Sixty Flying Inc., of Crystal, Minnesota which operated an FBO at the Crystal Airport where the corporate headquarters of all three companies was. North of Sixty Flying Services already operated Otter C-FAYR (436) which they had been flying since 1993, as well as a Cessna 206. Otter C-FTOK joined this fleet in June 1996. North of Sixty Camps had its main lodge at Obre Lake, at the head of the Kazan River System in the Northwest Territories. It had nine mini lodges in the area surrounding the main lodge – “strategically located in the Dubwant River and Kazan River systems, the hottest trophy waters in Canada for Northern Pike, Lake Trout and Arctic Grayling”. As its website went on to explain: “The area encompassing North of Sixty Camps is more than 10,000 square miles of virtually untouched virgin water. The area was previously only accessible by float planes based hundreds of miles away. Now with our 6,000 foot runway and float planes based at Obre Lake, the ‘land of the midnight sun’ is accessible”. The company chartered its own dedicated Convair 580 which flew its fishing guests from Winnipeg to the Lodge, a flight of two and a half hours. The Otters were then used to fly the fishermen from the main lodge to outlying lakes and lodges. The operation was summer only and during the winter months the Otters were stored, either at La Ronge or at the Crystal Airport, Minnesota. Otter TOK was damaged in a windstorm in May 2000 while in store at La Ronge but was repaired. At the end of the summer 2008 season, in October 2008, Otter TOK was advertised for sale by North of Sixty Flying Services. It then had total time of 8,200 hours and an asking price of US$800,000. It did not sell however and continued in use. In November 2009 the company, North of Sixty Camps, was advertised for sale to include the main lodge, the mini lodges and the airstrip, with an asking price of US$2.5m. The company North of Sixty Flying Services and its two Otters was also for sale. Again, no buyer emerged and the business continued. The Otters were no longer used, however, with Cessnas being used instead. Both Otters went into storage at La Ronge and were reported still in storage at La Ronge in May 2012, with trees growing between the floats They were later flown to Crystal Airport, Minnesota for continued storage there. The registration of both Otters was cancelled from the Canadian Register on 7 October 2012 and C-FTOK was deleted from the Canadian Register on 26 September 2013 as “exported to the United States”, having been sold to a buyer there. It was flown from Crystal to Geraldton, Ontario, base of Recon Air, who were to convert the aircraft to a turbine Otter for its new owner. It was registered on 5 March 2014 as N2YV to J.B.Leasing Company LLC., Nikiski, Alaska (a company associated with Michael Schilling of Kenai). At Geraldton it was converted as a Texas Turbines conversion with the Garrett TPE-331 engine and was repainted white with a purple cheatline and wing leading edges and a purple stripe down the floats. After the conversion had been completed, it remained in storage at Geraldton for several months. It was registered N2YV to Talkeetna Air Taxi Inc., Talkeetna, Alaska on 7 October 2014. Their pilots picked it up at Geraldton for the ferry flight to Alaska, which would be on wheels. Routing of the long flight, which departed Geraldton on 17 October 2014 was to Red Lake (Ontario) – Yorkton (Sask)-Lloydminister (Sask)-Fort St.John, BC-Watson Lake-Whitehorse-Northway-Talkeetna, where it arrived on 21 October. The following summer it entered service with Talkeetna Air Taxi Inc, joining turbine Otters N565TA (46), N100BW (58) and N510PR (250). These were joined for summer 2017 by turbine Otter N88765 (157). 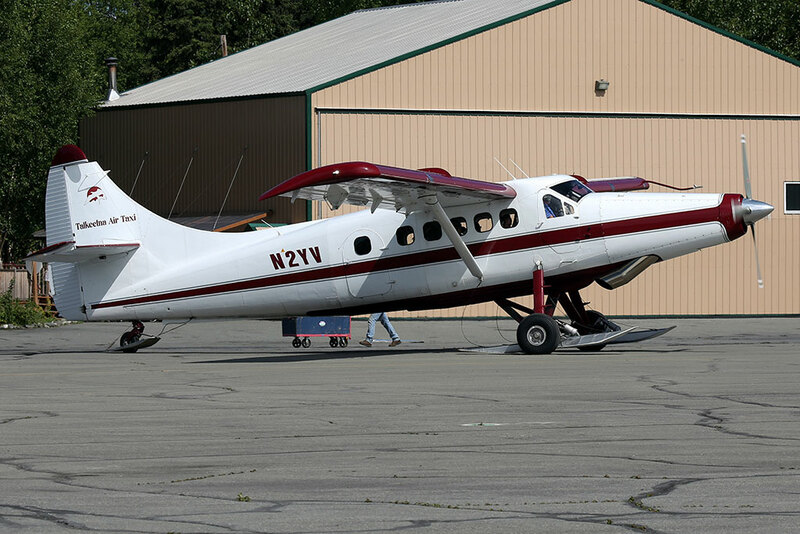 N2YV continues as part of Talkeetna Air Taxi’s five strong Otter fleet for summer 2018.